Let's talk about the satin stitch. I really like this stitch; I am not completely sure why because you have to be fairly patient to stitch it and it uses quite a lot of thread. Which kinda bothers me. So sometimes I use the Lazy Satin stitch instead. You can draw your shape so you have a guide to stitch from. Or you can use a single strand of 6-strand cotton to 'sketch' where to do your stitching, but do cover those stitches or remove them afterwards. In all the satin stitching I have done, I have found that starting at the widest part of the shape makes for the best result. For example, a circle, start in the middle and then work the sides, one at a time. When you are working a curvy shape like a circle, you will be stitching in steps. Each stitch is separated from the next by one thread in the fabric you are working on. Think of your fabric like a grid. 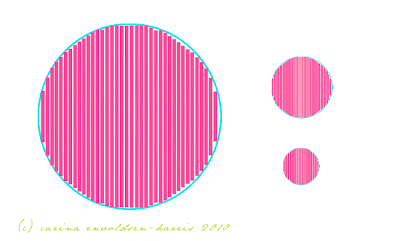 In the example of the circle, you work a few stitches on the same 'line' in the middle part. Then, as you move towards the sides you move down one AND one to the right (or left) and so on. Sometimes a circle looks more even if you do [middle part] then 1 down and 1 to the right, then another stitch on the same 'line' and then start doing the 1 down, 1 right. Usually you don't need to go all the way to each side with the stitches. The eye will still see it as a circle! Take a look at the drawing above, the large circle looks quite rough, but seen from a distance you don't notice. In this example maybe you can see how the stitches are done? You may have to click on the image to see it larger. The finer your fabric the easier it is to get a smooth result on a curved shape. Satin stitch in itself is raised above the surface, but if you fancy giving it a bit more oomph(! ), you can fill in the shape with straight stitches first, then do your satin stitching on top. Now. This is where it may become a bit controversial. These are not satin stitches. Or not proper ones, anyway. And don't believe anyone who tells you differently. I know satin stitches can be a bit tricky to work and maybe you think it looks horribly uneven at the edges. And you may be tempted to stitch around the edges to cover up the roughness. As I have in this image. But I urge you to fight this temptation with everything you've got! It is not very elegant.. If you are worried about your shape looking rough, remember this: while you are working on your satin stitching, you are probably really close to it (certainly if you're near-sighted like me!) and every little 'mistake' will look horribly large. But from a distance you will not be able to see all that- you will only see your satin stitched shape. So don't succumb to the cover-up stitches, ok! However, I do sometimes do stitches like those three. But I don't think of them as satin stitch. They look kinda like set jewels, so I think of them as 'jewel stitch'. All content (words & photos) copyright 2009-2013 Carina Envoldsen-Harris / Polka & Bloom. All rights reserved.